Every year between September and December, all businesses busy themselves with year end function preparations. Whether it is a large multi national corporation or a small startup, the year end function is a permanent fixture on everyone’s calendar. Employers look forward to organizing it and employees look forward to attending it. The term ‘year end function’ doesn’t do justice to what the event is about; it is more than just a farewell or pre-holiday celebration. Even with the state of our economic climate, companies and organizations are still ensuring that they budget for this event as the rewards and the ROI on this single event are invaluable. Now, before the event planning starts, a venue must be decided upon, and venue choice is probably the most important decision for this event, that you will make. Why does your year end function venue matter that much? You’re probably wondering what business strategy has to do with a year end function venue right? A lot, it would seem. A purpose must be clearly defined before planning the event as it will influence the type of venue you choose. For example; If your objective is to intimately engage and interact with staff, a small and cosy setting with round tables would be ideal. If you would like your employees just to let loose and have fun, a venue with cocktail tables, a dance floor and suitable acoustics will be a good option. The objective of your year end function must also be expressed in the invite as well as in all the communication leading up to the event. Your venue is the foundation for you to achieve your objectives. Certain venues only work with specific caterersand suppliers and you are limited to their choices. Find out who the chefs are and check out the restaurant and food reviews on sites like Zomato and TripAdvisor. Food plays a significant role in year end functions, and your choice of menu will speak volumes to the employees. Make sure that your menu caters to the needs of all the staff; you need to make sure you get the dietary requirements of each attendee. The attention to these types of detail will show your staff that you care and that you are mindful of their individual needs. Make sure that the caterer the venue provides is willing to prepare the food that is on your menu and that you can do a tasting as well. Other vendors to look out for are the florists, decorators and entertainment. If the preferred vendors of the venue aren’t up to your standards, request to use your own or find an alternate venue. Don’t settle for anything. Another thing to consider with the vendors is payment; see if there is a discount for an upfront payment and use the money that you save for party favours. If you pay attention to the detail, your guests will notice and appreciate the effort and thought that has gone into the event. This sets a standard and quite subtly encourages your staff to do everything with the same amount of pride as you do. While this may seem like an obvious or arb reason, it is often not thought of. Weather is unpredictable and can upset an event. If you have chosen an outdoor venue, make sure that they have an indoor section or a marquee and a plan B in place if the weather changes. Venues must also be equipped to handle other weather related needs such as; umbrellas, disposable rain coats and blankets. If not, make sure that you make these arrangements. There must be processes in place for getting everyone out the rain Your employees must get the sense that you want them to be comfortable and that you took all the necessary precautions and measures for them to have a pleasant time. The venue that you choose must be easily accessible by all; you need to consider the areas that people live in, whether they have cars or not if there is public transport and if it is affordable. You also need to consider safety, especially if you are having an evening event; you don’t want people to have to leave early because of those kinds of concerns. If there will be alcohol at the event, you should also consider organizing a take me home service; getting drivers to drive your guests home in their cars if they have had a bit too much to drink. This kind of gesture will show your employees and perhaps clients that you would and that you do go above and beyond to make sure that they are happy. This kind of thoughtfulness goes a long way in the business sphere, especially at a company event like a year end function. Apart from location, accessibility also refers to the access that people with special needs require. 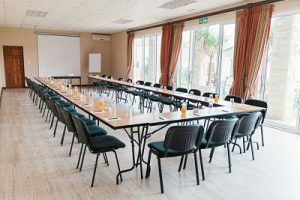 If you have guests that make use of wheelchairs or guide dogs or use braille, make sure that you inform the venue and that they are equipped to handle these needs. Everyone should feel welcomed and catered for - none of your guests should feel as if they were an afterthought. Another consideration is accommodation for the stay over events. Check if the venue has special group rates or packages for your event. Now that you know why your year end function venue is so important, why not come check out our venue for your next year end or corporate event? We guarantee that we will be able to provide you with everything that you need for the perfect event!